STOUGHTON, Mass. 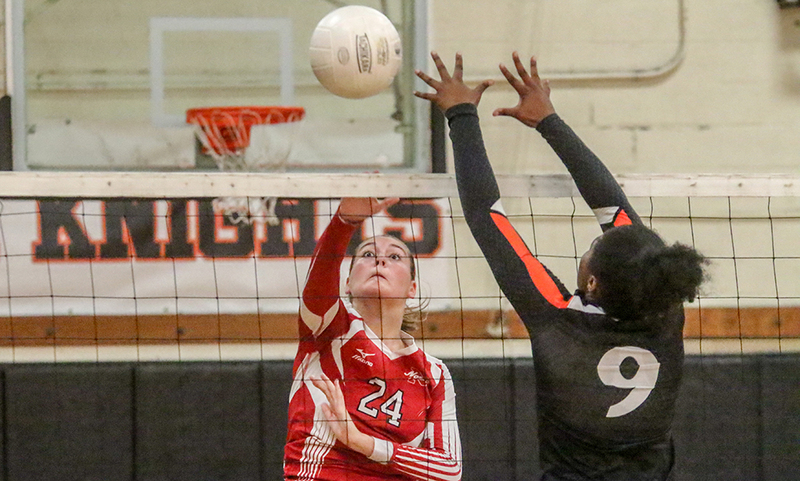 – When the official blew his whistle to bring an end to the point, he pointed towards Middleboro and it appeared that the visiting Sachems had just come from behind to take the opening set in Monday night’s Div. 2 South quarterfinal. The Stoughton bench and players immediately contested the call, and after a brief discussion it was determined that the officials had been mistaken. The player had been on the front line and was allowed to go for the hit. The point was ordered to be retaken and the Black Knights got a kill from Delaney Nagel to tie the set at 26-26. 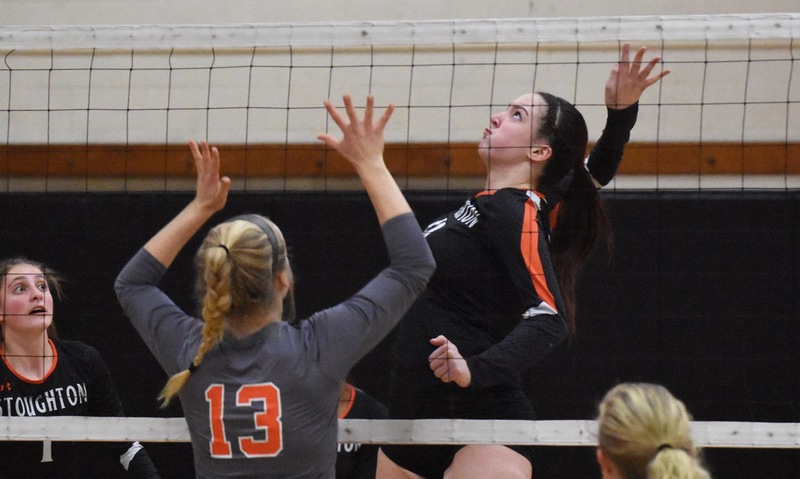 Stoughton went on to win each of the next two points and the first set and then used that momentum to sweep aside Middleboro in front of a vocal home crowd to reach the sectional semifinal. The Black Knights fed off the enthusiastic crowd, which included a decent contingent of Middleboro fans as well. The energy flowed from the stands onto the court. Stoughton jumped out to an early 6-1 lead in the first following kills from Nagel and Alexa Quinones. 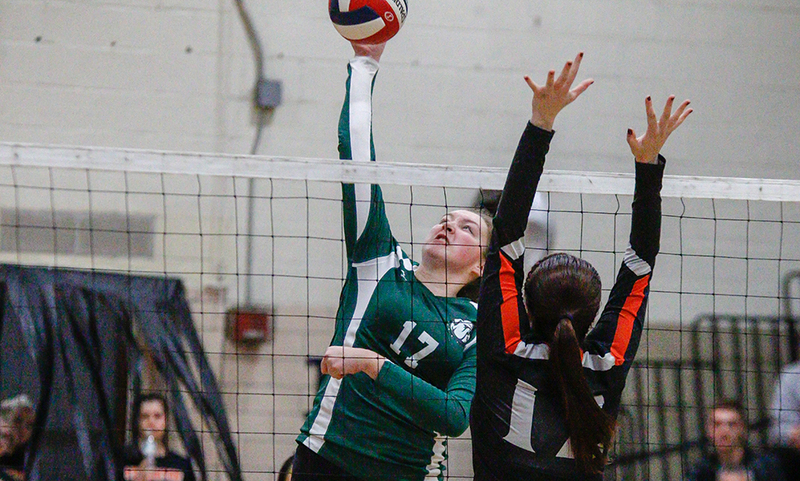 The Sachems battled back by winning six of the next seven points and the set remained close from that point forward. Turner won a point with her serve and Nagel had another kill in the middle to make it 16-13, but again the visitors went on a run, winning six of the next seven. Trailing 21-18, Stoughton went on a run to give itself a chance at set point. Quinones, Turner, and Amaya Morris each had kills to tie the set at 22-22. Hanna Holden made it 24-23 when she reacted first to a serve that barely skipped off the top of the net and found a hole in the Middleboro defense. A couple of mistakes gave Middleboro back the lead and it seemed as though the Sachems might have stolen the opening set, but the Black Knights rallied for a critical point. The second set was far more straightforward for the hosts, albeit still very close from start to finish. A Rachel Goulston ace put Stoughton ahead 12-8, its largest lead in the set to that point. The Black Knights built the lead up to six points at 20-14 behind two kills from Quinones and an ace from Mia Bennett. Bennett, who finished with a team-high 25 digs, also added a couple of big hits from the back line for points. Stoughton won the set 25-21. Leading by two sets and on the brink of the win, Stoughton didn’t take its foot off the pedal, jumping out to 11-7 and 15-10 leads. Although Middleboro battled to get back within one, Stoughton was able to keep its composure to secure the win. The Black Knights showed great balance on the offensive side with several players providing contributions. Nagel and Quinones each finished with eight kills and Turner chipped in with five kills and 16 digs. Stoughton (16-4) advances to face No. 3 seed Greater New Bedford Voke on the road. STOUGHTON, Mass. 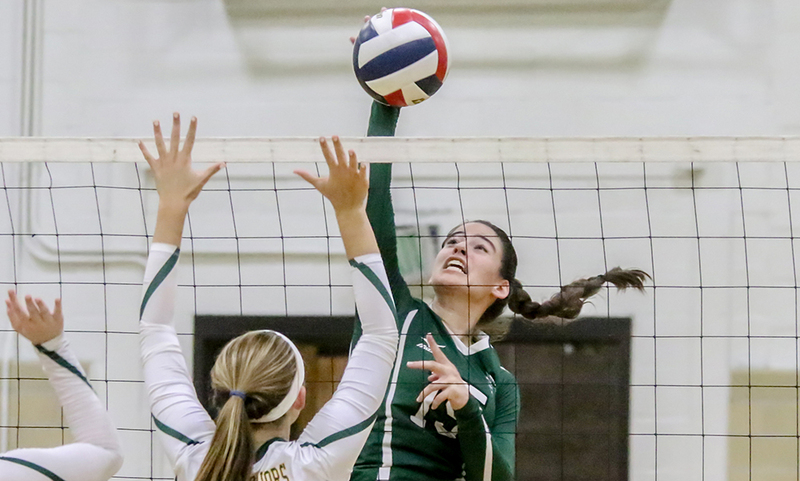 – After losing a lead late in the fourth set to rival Stoughton, the Canton volleyball team found themselves in a place they hadn’t been all year: a fifth set. And despite the Black Knights having the momentum and home court advantage, Bulldogs head coach Pat Cawley was confident her squad would be up to the challenge. Senior middle Erin Devine (12 kills, eight blocks) set the tone early in the fifth set with a pair of blocks that gave Canton a 5-1 lead. It was an advantage that the Bulldogs didn’t relinquish the rest of the way, earning a win in the fifth set and a 3-2 victory (25-16, 20-25, 25-15, 24-26, 15-9) over the Black Knights. Stoughton fought back on a pair of occasions to make the fifth set tight. After going down 5-1, back-to-back kills from Sasha Hyacinthe (eight kills) and Alexa Quinones helped get within a point. But a couple of kills from Taylor Harris (15 kills, 20 digs) kept the Bulldogs in front, forcing a timeout. Stoughton’s Hanna Holden (18 assists, 10 kills) had a kill and Amaya Morris landed a kill to give the Black Knights some momentum down 12-9, but Canton setter Nicole Brown (33 assists, 21 digs, five kills, three aces) picked the perfect time to dump the ball over on the second touch, catching the Black Knights’ defense. Devine registered a kill with a hard hit off a block out of bounds and Theresa O’Brien won a battle at the net for the game point. Before Canton earned the win in five, the Bulldogs were on the edge of a 3-1 win. Holding a 19-14 lead after a net infraction, it looked like Canton was positioned to close out the match. But three straight points from Stoughton, punctuated by a kill from Molly Turner (23 digs, 15 assists, 11 service points, eight kills, three aces) gave Stoughton life. Canton went up by four again, 21-17, but Stoughton refused to go away. A net call, a kill from Hyacinthe, and a Canton hitting error (after a couple of nice defensive plays from the Knights) tied the game 23-23. Stoughton went up 24-23, but Canton tied it back up on a hitting error. The Knights didn’t flinch as Delaney Nagel hammered down a kill and Veronica Noe gave the hosts a win in the fourth set with an ace. 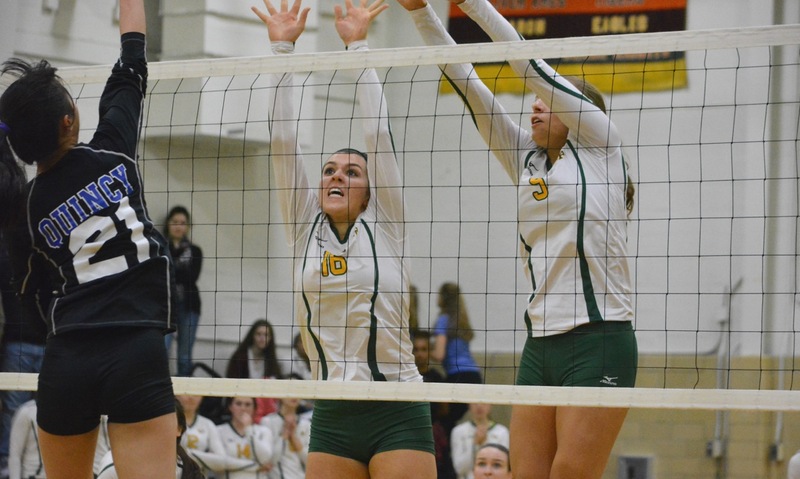 “The last time we played them, it definitely wasn’t our best game, and we lost 3-0 at their court, so to come back and go to five sets with them is incredible, I’m really proud of my girls for doing that,” said Stoughton head coach Erica Batchelder. Canton built a 12-6 in the first set, Stoughton rallied to make it a four-point game at 16-12, but the Bulldogs were able to finish it off. Julia Minichiello had a pair of aces and Harris added two more kills, including a nice line shot, to clinch the first set. Stoughton responded with a win in the second set. It was tight throughout, with neither side holding more than a four-point advantage in the early stages. The Knights took a 17-14 lead only for Canton to storm back to get within one, down 20-19. The Black Knights finished it off by winning five of the next six points, including consecutive kills from Turner and Nagel, an ace from Turner, and a kill from Hyacinthe to make it 1-1. The third set went similar to the second, with the teams trading points in the early stages. Canton had its first real advantage at 11-8 and then extended that advantage to 17-10 with four of those points coming off kills or blocks from Devine. Devine had just two total errors on 36 attack attempts. An ace from freshman Sydney Gallery and a kill from sophomore Liz Bickett (seven kills, two blocks) helped Canton earn a 25-15 win in the third set. With the win, Canton volleyball (12-1 overall, 12-1 Hock) moves within one win of clinching at least a share of the Davenport division title. The Bulldogs host Sharon on Wednesday. Stoughton (10-4, 10-3) will try to bounce back on the same day when it travels to Foxboro. STOUGHTON, Mass. – Sometimes a loss, especially early on the season, can turn into a valuable learning opportunity. That was the case for North Attleboro, suffering a 3-2 non-league setback to King Philip last week. Now Stoughton is hoping the same will come true for them after dropping a 3-2 decision to the visiting Rocketeers on Monday night. Stoughton took the first game, and then went up 2-1, but North Attleboro responded each time and came away with a 21-25, 25-15, 16-25, 25-23, 15-6 win. North Attleboro head coach Jeff Crins believes his team’s ability to bounce back is a direct correlation from having been in the same scenario less than a week ago. For Stoughton head coach Erica Batchelder, she’s hoping her squad – who hadn’t lost more than one set all season – will use this as a lesson. The Black Knights got off to a strong start in the first game. North Attleboro’s Kezia De La Cruz (13 kills, two aces) opened the match with back-to-back kills, but Stoughton then rattled off a 10-1 run to seize a 10-3 lead. Stoughton kept its offense up, building a 19-8 lead behind a kill from Molly Turner (16 assists, seven kills, five aces) and it looked like the Black Knights would cruise to an opening game win. But North Attleboro got into a groove behind strong serving from Leah Marceau. A block kill from Anna Caristi capped an 11-4 run for the visitors to cut the deficit at four, 23-19. But Turner was able to finish off a kill to give Stoughton a 25-21 win. While North Attleboro didn’t come away with the win in the first game, the momentum captured in the comeback attempt carried over into the second game. Holding to a one-point lead early, the Rocketeers rattled off a 10-0 run, highlighted by a pair of kills from Tori Melanson (13 kills, seven blocks) and an ace from Emma Gunn to take a 17-6 lead. The Rocketeers were able to keep that 10-point cushion the rest of the way, getting kills from Melanson, De La Cruz, Caristi and Katie DeMontigny to take a 25-15 win. The third game was much tighter throughout. North Attleboro’s Amelia Murphy (18 kills, two aces) cut the Stoughton lead to just two at 15-13. But a quick 4-0 burst, including an ace from sophomore Makiah Simpson – suddenly put the Black Knights up 19-13. Big Red called a timeout when Stoughton’s lead went to 22-16, but the break didn’t phase the Black Knights, getting the final three points via kills from Val Whalen (12 kills, four blocks), Hanna Holden (11 assists, four kills) and an ace from Turner. The fourth game started out similar to the first as Stoughton raced out to a 10-3 lead, punctuated by an ace from Taylor Levine. But North Attleboro rallied for a 7-0 run to tie the game. Tied 16-16, Big Red then hit a 5-1 stride to take a 21-17 lead and force a timeout from the Knights. Stoughton rallied to cut the deficit to one (22-21), forcing Crins to take a timeout. A kill from Whalen brought Stoughton within one (24-23) but an error allowed North Attleboro to take the win and force a fifth set. That’s when experience showed. North quickly turned a tie game (3-3) into a 9-4 lead behind a big kill from Murphy, forcing a timeout. Murphy registered another kill on the next play, added two more to extend North’s lead to 13-5. With game point on the line, Marceau set Murphy up and she slammed down her 18th kill for the win. North Attleboro (7-1 overall, 6-0 Hockomock) returns home on Thursday to host Milford. Stoughton (7-1, 5-1) hosts Sharon on Wednesday evening.